Check this area often for special financing offers on Gleaner products. You can also access the Gleaner product configurator, request a demo or find out more about AGCO Finance. Visit this area for information about GleanerCare 24/7 priority service and the GleanerGuard 2-year header to spreader warranty. You can also learn more about AGCO Parts and how to get technical publications for your Gleaner products. Visit this area to view the roadshow videos, download literature or read the latest Gleaner newsletter, our quarterly publication for fans of Gleaner combines. You can also order printed materials, request DVDs or sign-up for our mailing list. To download digital assets, visit AGCOnews.com. Hesston, Kan. (Nov. 12, 2015) — Gleaner®, the industry-leading transverse rotary combine brand from AGCO Corporation, (NYSE:AGCO), introduces the Gleaner S9 Series combines, offering even more harvesting performance, technology, comfort and convenience to help growers harvest their crops faster and more efficiently, even in less than ideal conditions. Available in 2016, the S9 Series includes three models, the S96, S97 and S98 to meet the needs of growers seeking class 6, 7 and 8 machines. The new S9 Series builds upon Gleaner’s reputation for providing what farmers want in harvesting technology — capacity, grain quality, low loss levels, reduced compaction and serviceability. With the comfort of an all-new Vision™ cab and operator convenience delivered through the new Tyton™ terminal, plus modifications to the feeder house, drive electronics and drive mechanics, the S9 Series brings current and future Gleaner owners a level of harvesting performance not offered by any other combine. In Gleaner tradition which began in 1923, many of the S9 Series enhancements are the result of requests from growers and were developed and tested in the field under true harvest conditions. 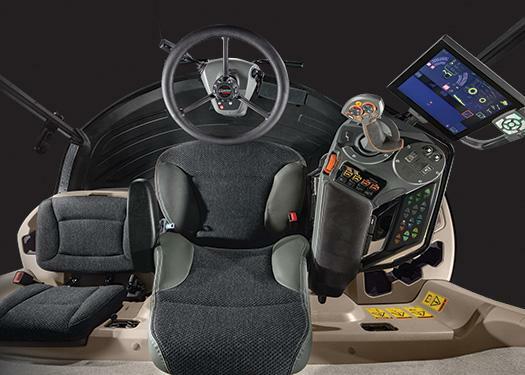 Gleaner’s Vision cab has many new features to enhance operator comfort and simplify control, reducing operator fatigue and increasing productivity. The completely redesigned cab is 15 percent larger than previous models and has a larger instructor seat with a fold-down back that doubles as laptop computer storage and workspace. The cab features a 22 percent larger, deep-curved front windshield and 66 square feet of total glass area for an exceptional view of the cutter bar, header ends and harvested areas behind each side of the header. A solar-protectant laminate minimizes sun exposure through the front glass and sound-deadening material throughout the cab keeps operating environment as quiet as 75.5 decibels in corn. The completely redesigned control console is located to the right of the operator seat for increased operator comfort to reduce fatigue during operation. Ergonomic placement and intuitive color-coding of the buttons and switches give the operator quick and easy access to all combine functions. A multi-function hydro handle controls travel direction and speed and easy access to buttons to engage the processor, header and parking brake. The throttle lever is conveniently just under the thumb of the operator for intuitive adjustment of engine RPM. All header adjustments and controls are consolidated on a panel outside of the monitor. 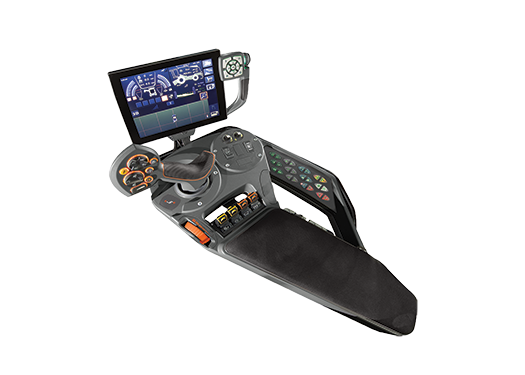 Buttons to adjust rotor speed, gear selection and bin extension operation are intuitively located on the right edge of the console. A slim-profile steering post, new cab post placement, 12 new cab lights with high-lumen projection and new dual remote mirrors are among the two dozen innovations of the Vision cab. A central feature of the Vison cab is the new Tyton terminal, providing the full menu of products and services from Fuse®, AGCO’s next-generation technology approach to match the needs of modern precision farming practices. Available first on Gleaner combines, the new Tyton terminal has four quadrants, easier-to-read Gleaner-specific graphics and an easy-to-use, color touch-screen interface, so operators may monitor and control multiple combine functions, many with a single touch. Mounted on an accessory bar off the operator seat armrest, the Tyton terminal can be positioned by the operator for the best visibility of the monitor and header. Gleaner S9 Series combines offer growers the choice of a factory-installed FieldStar® Live or AgLeader® Live yield mapping system integrated through the Tyton terminal. Both systems integrate data from yield and moisture sensors, global positioning and the Tyton terminal to provide live mapping. Automatic header width control is included for even more accurate yield calculations. Available TaskDoc task management and record keeping solutions provide complete field documentation systems for growers, offering quick, secure and reliable wireless transfer of data between the machine and the office. In addition, the S9 Series offers the optional Auto-Guide™ guidance system with a NovAtel® satellite receiver that comes from the factory set up for WAAS to ensure maximum steering accuracy and efficiency. Auto-Guide control also is integrated through the Tyton terminal, eliminating a separate screen in the cab. Two levels of AgCommand machine monitoring are available to help minimize downtime, and Fuse Connected Services that enable remote equipment and operational support from the local Gleaner dealer are also available. With the S9 Series, Gleaner’s hallmark “natural-flow feeding” has been refined to improve feeding capacity in difficult crop conditions such as heavy canola swaths and green-stem soybeans where uneven feeding can occur. The feeder house floor has been lowered and the feeder house runners and torque tube raised, creating clearance under the feed shaft. These changes reduce stress on the shaft, yet maintain good control of the crop mat in difficult feeding conditions. Also the feeder house has been lengthened for better visibility of the cutter bar from the new Vision cab. With increasing header size and the longer feeder house, geometry on the header lift cylinders has been redesigned to maintain excellent lift-ability. And, a proportional valve has been added to the header-lift hydraulic system, so the operator can adjust header raise/ lower speed and sensitivity to their preference using the Tyton terminal. New electronics and redesigned hydraulic systems eliminate all cables and linkage for the hydrostatic propel system. Exacting programming of speed and torque sets the hydrostatic motor to optimum displacement providing speed and torque as needed, whether climbing a hill or looking for a faster road speed. The Gleaner S9 Series includes many additional drive component updates to improve not only combine performance, but also enhance reliability. A 390-bushel grain bin is standard. The newest Gleaner S9 Series combine will be available from dealers for 2016 and will be on display at various winter farm shows beginning with the 2016­­­­­­­­ National Farm Machinery Show. For more information about Gleaner combines or to find a dealer near you, visit www.GleanerCombines.com. ©2015 AGCO Corporation. Gleaner is a registered trademark of AGCO Corporation. AGCO Corporation (NYSE:AGCO) is a global leader in the design, manufacture and distribution of agricultural equipment. AGCO supports more productive farming through a full line of tractors, combines, hay tools, sprayers, forage equipment, grain storage and protein production systems, seeding and tillage implements, and replacement parts. AGCO products are sold through five core equipment brands, Challenger,® Fendt,® GSI,® Massey Ferguson® and Valtra,® and are distributed globally through a combination of approximately 3,100 independent dealers and distributors in more than 140 countries. Founded in 1990, AGCO is headquartered in Duluth, Georgia, USA. In 2014, AGCO had net sales of $9.7 billion. For more information, visit http://www.AGCOcorp.com. For company news, information and events, please follow us on Twitter: @AGCOCorp. For financial news on Twitter, please follow the hashtag #AGCOIR. Want to stay current with information about Gleaner? Just fill out a short form to sign up for our mailing list and receive timely updates on products, events and more. At AGCO Gleaner, customer care isn’t just a department, it’s a commitment. Contact us if you have any Gleaner related questions or concerns. AGCO and GLEANER are registered trademarks of AGCO Corporation.